Doodle4Google – “Natural and Cultural Paradise – Assam” by Vaidehi Reddy. In 2009, Google India launched the Doodle4Google competition. It is an invitation for students from grades 1to 10 to design the Google Doodle to celebrate Children’s Day in India. The theme for this year’s competition was “A place in India I wish to visit”. Google received over one million entries from more than 1700 schools across 50 cities in India. Google India announced Vaidehi Reddy as the winner of this year’s Doodle4Google design contest. She was honoured at an event in New Delhi on November 12, 2014. The above winning Doodle titled “Natural and Cultural Paradise – Assam” went live on the Google (India) home page today, November 14, Children’s Day. On this Children’s day, India remembers and honours the country’s first Prime Minister Shri Jawaharlal Nehru born in 1889. The children of India fondly called him “Chacha Nehru” (Hindi: चाचा नेहरू)) or Uncle Nehru. Jawaharlal Nehru always emphasized the importance of showering love and affection on children. He saw in them the future of India. The Government of India has established 18 Biosphere Reserves of India. Nine of these biosphere reserves are a part of the World Network of Biosphere Reserves, based on the UNESCO Man and the Biosphere (MAB) Programme list. This list includes the Gulf of Mannar Biosphere Reserve that covers an area of 4,054 square miles (10,500 sq km) on the south-east coast of India in the Gulf of Mannar. In addition to protecting the flora and fauna in the region, protection is also given to the human communities who live in these regions, and to their ways of life. 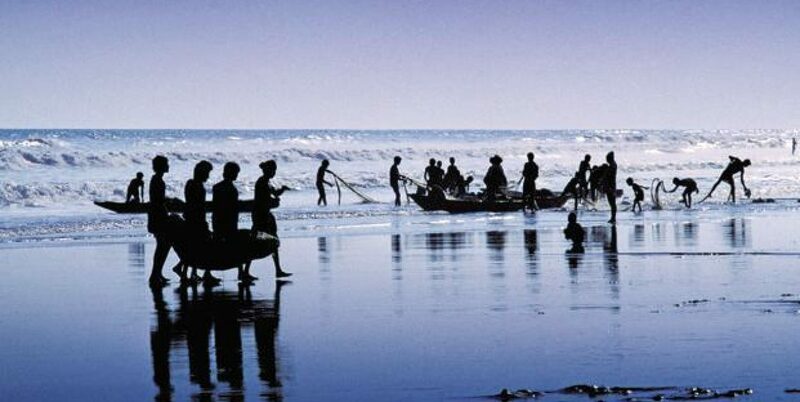 Gulf of Mannar is one of the richest coastal regions in southeast Asia. It nurtures over 3,600 species of flora and fauna. Biological researchers have identified more than a hundred hard coral species. Dolphins, sharks, sea turtles and oysters abound in the gulf. Frequent visitors to the gulf are the globally endangered sea cow (Dugong dugong), a large marine herbivorous mammal. Other endangered species are the dolphins, whales and sea cucumbers. Also, the gulf has six endangered mangrove species endemic to peninsular India. The Indian coast in the Gulf of Mannar extends from Rameswaram island in the North to Kanyakumari in the South of Tamil Nadu. The Gulf of Mannar Marine National Park is a protected area of India consisting of 21 small islands in the Gulf of Mannar covering an area of nearly 216 square miles (560 sq km). It lies up to 10 km away from the east coast of Tamil Nadu, South India, stretching about 160 km between Thoothukudi (Tuticorin) and Dhanushkodi. It is the core area of the Gulf of Mannar Biosphere Reserve which includes a 10 km buffer zone around the park, including the populated coastal area. The park is endowed with a high diversity of plants and animals in its marine, intertidal and near shore habitats. The park is part of the 87 miles (140 km) long and 15.5 miles (25 km) wide Mannar barrier reef. It lies between 8° 47’ to 9° 15’ N latitude and 78° 12’ to 79° 14’ E longitude. The Gulf of Mannar Biosphere Reserve comprises the 21 islands of the Gulf of Mannar Marine National Park, with estuaries, mudflats, beaches, forests of the near shore environment, including marine components like algal communities, sea grasses, coral reefs, salt marshes and mangroves. The 21 islands vary from 0.25 hectares (0.62 acre) to 130 hectares. (321.2 acres). Total area of the islands is 2.41 sq miles (6.23 sq km). Well-developed coral reefs occur around all these offshore islands which are mainly composed of calcareous framework of dead reef and sand,and have a low and narrow sandy coast. The 21 Indian Islands in the Gulf of Mannar. The islands are listed below, southwest to northeast. *4. Vilangushulli Island, 0.95 ha, 8.93815°N 78.26969°E. *Due to excessive coral mining, Vilangushulli Island island is now 1 metre below mean low tide level. There were two more islands named Pandayan and Punnaiyadi at 8.78075°N 78.19536°E. But these were destroyed during the construction of the new artificial deep-sea Tuticorn Port. There are numerous other nondescript islands located close to Thoothukudi city. Of these Muyal (or Hare) Thivu and Nalla Thanni Islands attract visitors during weekends and festival seasons. *7. Nalla Thanni Island, 101.00 ha, elevation 11.9 m, 9.10667°N 78.57885°E. *Nalla Thanni Island island was populated recently. 21. Shingle Island, 12.69 ha, elevation .6m 9.24174°N 79.23563°E. *Musal (or Hare) and Kurusadai Islands were recently populated. The shallow waters surrounding these islands harbour three species of seagrass that are found nowhere else in India. Representatives of every known animal phylum except amphibians are found on this island.